Jake Foster led the way for Westboro with three goals and an assist. I think we can safely say the growing pains were worth it for Westboro. Under first year head coach Tom Baker, the Rangers began the season 1-2, including a 12-3 defeat at the hands of the very team they played Tuesday. Round two for Westboro and Shrewsbury would be a completely different story, however, as the now-healthy Rangers seem to have fully adapted to their new coach's freelancing offensive philosophy. Jake Foster and Connor Joyce each had hat tricks, and both Sean Anderson and Tony Cibelli chipped in a pair as the Rangers dominated Shrewsbury from start to finish, winning 14-4. For those of you that haven't read my full recap on BostonLax.Net, you can check that out and watch the highlights here. While the Ranger attack was diverse and potent, the real problem for Shrewsbury was that they just couldn't get the ball. 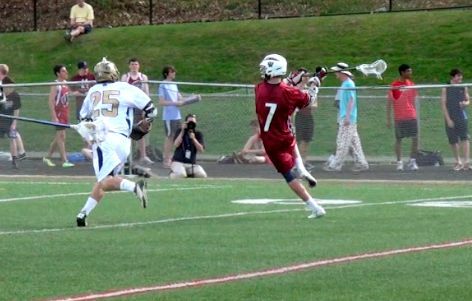 Tom Lawton is probably the best face-off guy in Central Mass, and if he lost one draw all day, I missed it. The guy changes games, and Shrewsbury coach Nate Skermont told me before the game that just slowing down the Rangers after the draw would be key. He almost conceded that you couldn't beat Lawton very often, if at all, on face-offs. The Colonials had brief life in the first when leading scorer Luke Warner put them on the board. Shrewsbury only trailed 3-1, but Jake Foster stepped up for Westboro, attacking the cage and scoring just 30 seconds later. A few minutes later, Connor Joyce extended the lead to 5-1, but Foster put an exclamation point on the first quarter, beating his man and bouncing one past Shrewsbury's talented goalie Chris Gorman. That pushed the lead to 6-1 at the end of one, and you just felt the wind come out of Shrewsbury's sails. For the Colonials, they've got to get healthy. They were only missing one regular starter to injury, but clearly multiple guys are playing nicked up. I mentioned Gorman getting beat, but he was a relative bright spot, despite surrendering 14 goals. A lot of those were clean looks that were almost impossible to stop, and he did make nine saves. Things could have been worse. For Westboro, they've just got to keep improving. At a time of year when everybody else seems to be piling up injuries, the Rangers are getting healthy and rounding into form. Cibelli has carried the scoring burden lately, but this inspired play from Foster and Joyce gives you reason to believe the Westboro attack can keep up with anybody. Of course, we know that now-healthy goalie Dan Terry and Co. can take care of business on the defensive end. One thing's for sure, these Central Mass playoffs are going to be interesting.